The Canal Towns that border the C&O Canal National Historical Park are home to some of the area’s most unique and exciting annual events. If you haven’t attended these shindigs in the past, make sure to add them to your calendar this year! 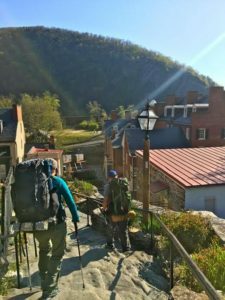 The “Flip Flop” festival celebrates thru-hikers that are looking to begin their journey along the Appalachian Trail here in Harpers Ferry and Bolivar. This year the festival is being expanded to showcase the outdoor opportunities available in the area, including cycling, water sports, and more. There are plenty of other activities to enjoy including food, music, and fun for all ages. Learn more by visiting the website at https://www.appalachiantrail.org/promo/75th-anniversary/upcoming-celebrations/2017/04/22/default-calendar/flip-flop-festival. C&O Canal Days in Williamsport is a great way to enjoy family friendly activities and entertainment. Not only is this event a celebration of the Canal Town of Williamsport, but it is a celebration of the C&O Canal as well. Featuring Canal Boat tours, nature walks, and presentations, as well as food and craft vendors and demonstrations, you can get a feel for how the C&O Canal helped to shape this town. Learn more about this event by visiting the town’s website at http://williamsportmd.gov/canel_days.html. Save the date for the C&O Canal Trust’s 7th annual Park After Dark gala! 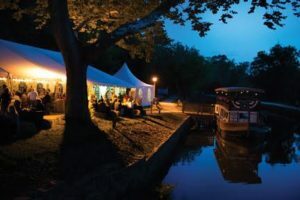 This fundraiser helps to support the C&O Canal National Historical Park and is held under the stars in the Park at the beautiful Historic Great Falls Tavern. Here you will be able to enjoy live music, dancing, great food, libations, unique auction items, a campfire, and much more! Tickets will go on sale in June – watch the Trust’s website for more information! The Point of Rocks Ruritan Club’s 8th annual “Art at the Point” festival is a celebration of local musicians and artists alike. There are opportunities for children to express their artistic side by heading over to “The Young Artist Tent” where they can enjoy making puppets. BBQ and hotdogs will be served so bring your appetite. Art of all mediums will be available for viewing and purchase during the festival. For more information on this event please visit the website at http://pointofrocks.org/art/. The B&O Railroad helped to shape the Canal Town of Brunswick and, as such, the railroad is deeply ingrained in its heritage. 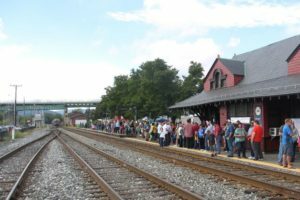 Along with food, vendors, children’s activities and much more, there will be round-trip train rides offered both days in honor of the railroad. This popular event draws 4,000-6,000 people each year. For more information about this event please visit their website at http://brunswickmd.gov/railroad_days. In the Canal Town of Shepherdstown the American Conservation Film Festival takes place on the weekends of October 13-15 and 22-23. During this festival over 30 films will be shown from around the world. The focus of these films ranges from climate change to wildlife. This festival helps to provide a venue for films that are not generally seen by the public, celebrate conservation films and support young filmmakers. The goal of this festival is to engage, inform, and inspire people with these conservation films. Learn more about this event by visiting the website at http://conservationfilm.org/.